Here are some great tips and plans for growing onions, shallots, scallions, and leeks from seed. Also, the basics for growing unique Egyptian onions in a vegetable garden! Tips on planting, harvesting and storing onions. Planting onions in any type of home vegetable garden is simple and easy. Whether you are planning a traditional in-ground garden, or a raised bed, container or potted vegetable garden this year, be sure to include several types of onions and onion relatives such as scallions, shallots, leeks, in your garden plan! Onions take very little space in the garden, so even if you are planning a small organic vegetable garden, you will likely have room for a row of onions. If you are planting a container or potted vegetable garden, be sure to plan for at least one pot of either green or yellow onions. Growing onions does not take a lot of space in your vegetable garden, as ten feet of garden space devoted to growing onions will yield about 10 pounds of onions. Whether grown in-ground, in a container, or raised bed vegetable garden, onions are one of the easiest and most useful vegetables to grow. 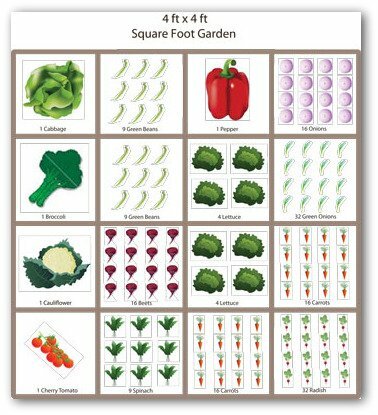 There are many delicious varieties to grow in your home vegetable garden; from small green onions, to red, purple, yellow or sweet onions. To prepare the garden site for planting onion sets, make a furrow 1-2 inches deep and plant the small bulbs two inches apart with the root end down. Cover the sets with enough soil to conceal the tops of the bulbs. Small green onions can be grown from seeds planted directly into a small furrow in the garden. Growing onions require full sun. Recommended varieties are Excel, Texas Grano, White Granex, and Tropicana Red. Choose varieties selected for your region that produce bulbs in the early spring. The plants are tolerant of frosts and light freezes. Seed germination takes an average 7-10 days. Days to harvest from seeds are 120-160. Space seeds 6 to 8 inches apart in prepared soil. Bulbs are frequently shared with neighbors. From transplants to harvest in 110-120 days. Spacing should be one to two feet between rows. Space between the growing onions needs to be 4-6 inches with a planting depth of ½ inch. For a fresh supply of onions, you need 15 plants per person. Use pots or planter boxes for growing onions in container gardens. Plant onion bulbs or seeds in a good quality potting soil with added fertilizer. A raised vegetable bed of growing onions eliminates some of the "down and dirty" part of traditional gardening. The beds can be raised a foot or more high enclosed with landscape timbers, cement blocks, or treated lumber. 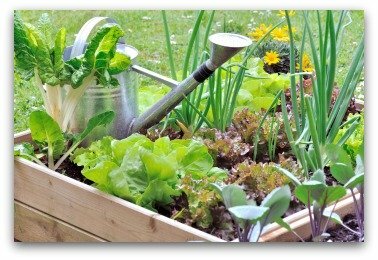 You can sit on the edge of your garden when planting, tending, and harvesting your garden. Onions can easily be grown in an organic vegetable garden. Simply plant organic onion starts or seeds, fertilize the soil with an organic fertilizer such as compost or well-aged manure, and you will have organic onions! Many gardeners pull soil away from the tops of growing onions but this is not necessary as they seem to push themselves up out of the soil when ready. Feed every three to four weeks with a 6-6-6 fertilizer if needed. Several onion relatives also flourish in gardens. Shallots and multiplier onions produce clusters of bulbs to be divided like garlic cloves. Strong flavored scallions and bulbs are used for cooking or making pickles. Bunching onions are grown to eat fresh. They produce quickly, with many varieties yielding a harvest within 50 to 75 days. 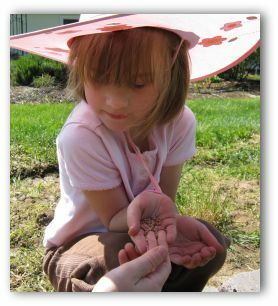 Plant seeds or divide clumps and space 2 inches apart. Popular varieties include Perfecto Blanco, Evergreen, and Beltsville Bunching. 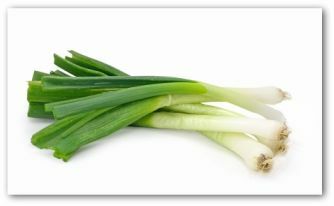 Leeks are a mild flavored onion relative who resemble scallions and are used in soups, stews, and salads. 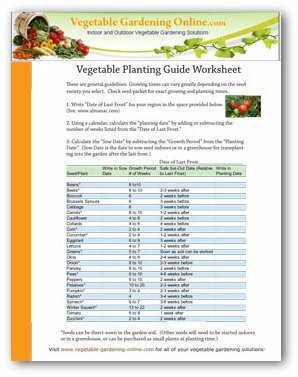 Plant the slow-growing seeds one to two inches apart in October and harvest stems during late winter and spring. Popular varieties include Titan and American Flag. Sweet Vidalia onions are big beautiful onions with a sweet taste. Speculation is the lack of sulfur in Georgia soil causes the sweetness or it is perhaps caused by the combination of climatic conditions and soil conditions. Shallots Delicious mild-flavored cousins of onions, shallots are perfect when you want a hint of sweet onion, and a touch of garlic, but not to be hit over the head with either! Shallots are great in soups and stews in the winter months. 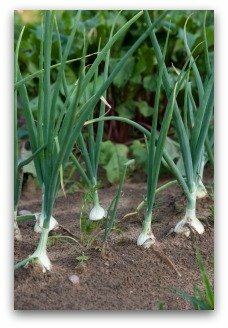 Egyptian onions are a unique cold-hardy perennial onion that is very easy to grow. They will also tolerate heat and poor soil. They are disease and pest resistant. 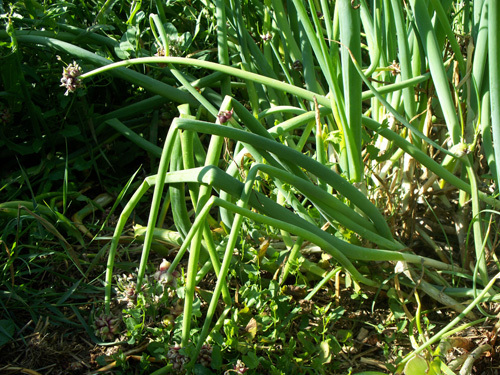 Plant Egyptian onions anytime from early spring until snow falls in the fall or winter. The green shoots that grow in the spring can be used like green onions or chives. Also called tree onion, winter onion or walking onion. They are called walking onion because the bulb clusters which grow on the top of the plant, bend down to the ground from their own weight as they grow. The bulbs take root in the ground, and begin to grow new plants! Harvest young green stems as scallions when the bases begin to bulge. Harvest mature large onion bulbs in late spring after the tops fall over. 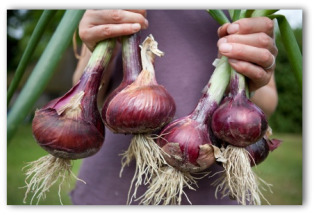 To harvest, gently loosen bulbs from the soil and spread out to dry in an airy location away from direct sun. Onions have an excellent storage life and are a great choice for beginner home gardeners. Keep onions in a cool dark spot with low humidity for storage to extend shelf life. 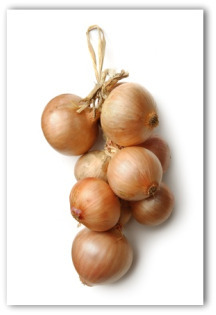 Onions can also be braided by their dried tops and hung in a cool dark spot for storage. One last tip on growing onions; to peel an onion without "crying", put a piece of bread on the point of the knife you are using or peel the onion under running water. (Or just enjoy having a good cry; and get your feelings out!) 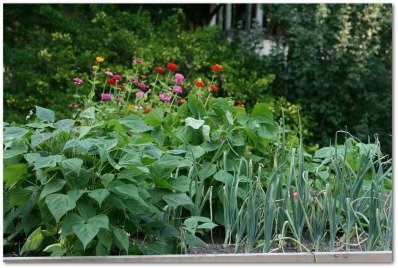 Vegetable gardening that included onions is a "must" for every gardener! Onions add Flavor to Home-Cooked Meals! Onions are a delicious compliment to many foods and flavors. For onion lovers, the spicy flavor makes all the difference in everything from a sauce, to the perfect hamburger, or delicious salad. The best cooks know the importance of onion flavor in their signature culinary dishes.